Ever wanted to download PC softwares for free but don’t know where to get them? This post is for you. Opera PC Apps Hub is a download section on Opera.com basically meant for software which Opera considers essential for people to have on their PCs. 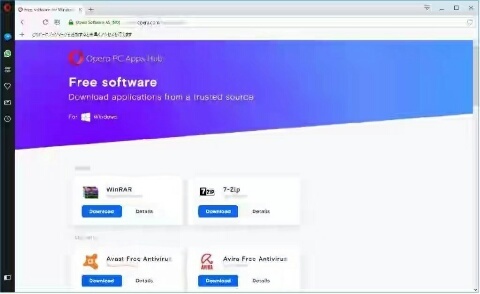 Therefore you can check out the Opera apps hub anytime you need to download a free PC software for your computer. Although there are still other alternative websites and apps which lets you download free PC software but some of those websites contains viruses, malicious Malware and other dangerous programs that could harm your PC and even you. So I vet on Opera because it’s one of the most trusted online franchise used by millions of people worldwide. Based on Opera employees’ preferences, software popularity and quality, Opera selected and gathered essential applications for your PC into one place for your downloading convenience. Unlike most other software hubs, you will see a catalogue with clear, simple previews of basic apps without ads, hidden obligations nor outdated download links. This makes it possible to easily download quality software straight from its developer, at Opera PC Apps Hub. Opera PC Apps Hub is specifically designed as applications are grouped into categories to ease app search and downloading. It’s simple. To download any free software from Opera Apps Hub, go to PCappshub. You will be amazed at what’s on ground there. You may call it a website category or an app. So what do you think? Meanwhile, those of you that need to download Android paid apps for free, you may check AC Market while those Apple fans that want to get free iPhone apps should check this article on how to download paid iOS apps for free. Enjoy. Previous articleBlack Friday 2018 Is Here. Are You Ready?